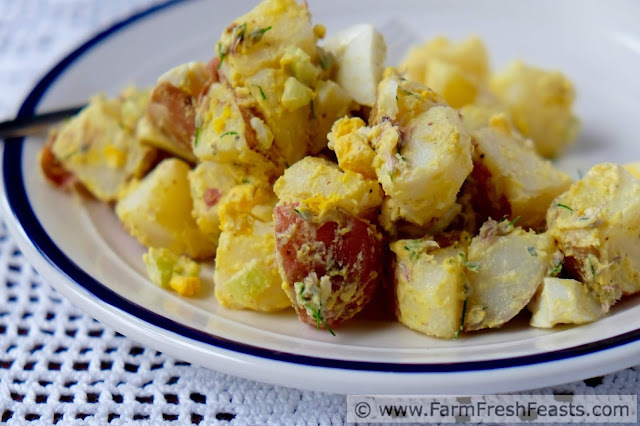 A fresh and pretty side dish for a Spring table, this potato salad combines chive blossoms and hard cooked eggs with red skin potatoes and tangy mustard. 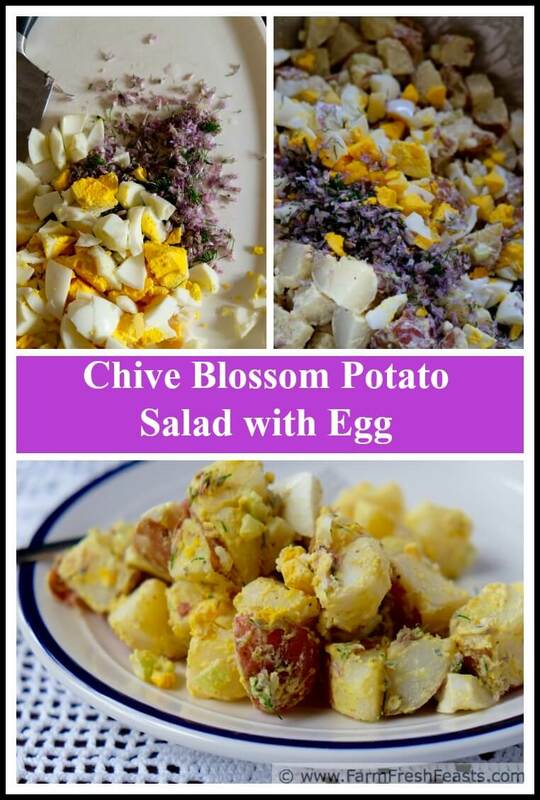 This chive blossom potato salad is as pretty as it is flavorful. When I made my Chive Blossom Focaccia I was a bit bummed that the pretty purple color of the blossoms baked into a more bread-like brown. I figured that adding chive blossoms to a potato salad would look pretty and fresh for Spring, and add that delicate chive flavor to the dish. We eat a lot of potatoes, so I've shared a lot of potato salads on the blog. I started off with my family's summertime favorite, Confetti Potato Salad. 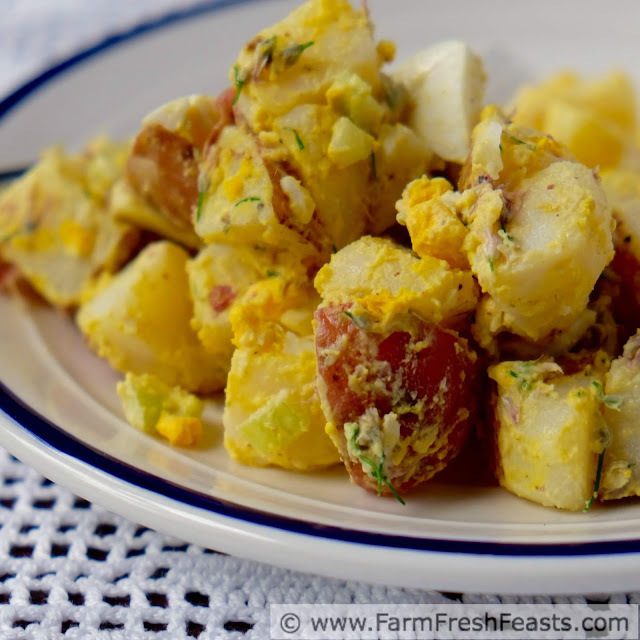 I shared a tangy Roasted Potato Salad with Creme Fraiche. And I got some green beans in on the potato salad action with my Hot French Potato Salad. Add our wintertime favorite Make Ahead Irish Mashed Potato Casserole, and a Colorful Roasted Squash and Potatoes side dish, and I think I've just plotted out my daughter's dream menu plan. She loves her spuds. Being a seasonal eater, when the weather turns warm I want to eat cool dishes, not heavy baked casseroles. 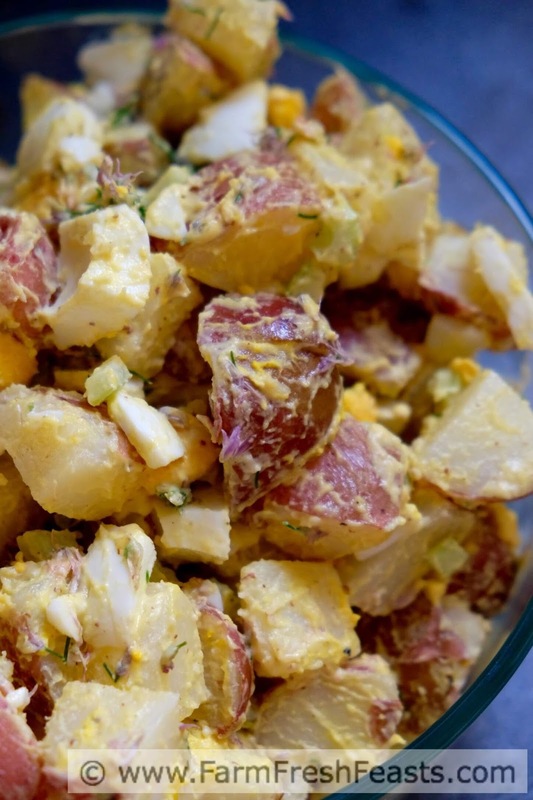 This potato salad fills that need while looking pretty on the table. It's terrific on those Spring days where it's cool in the morning then warm and sunny during the day, making you rethink your dinner plans to something cooler and lighter. Add a salad of fresh greens, maybe some bread and cheese, and you've got a nice Spring meal. I don't usually add eggs to our potato salads, but in Spring when my friends chickens resume laying I love to add eggs to many things. I thought the rich yellow color of the yolks--really the only difference I can see in free range vs store bought eggs--makes a very nice contrast to the purple blossoms. During years with a late Easter and early warmth, you could even use the leftover hard-cooked Easter eggs along with your freshly harvested chive blossoms. 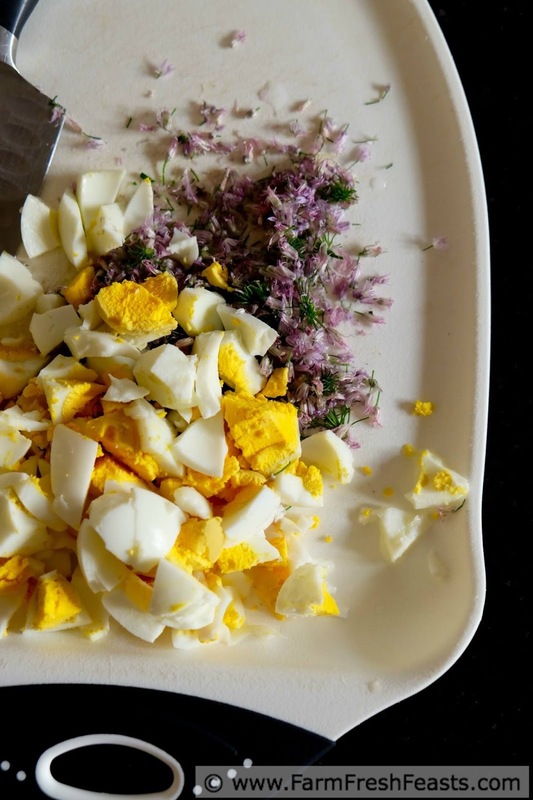 For more recipes using herbs, please see my Recipes Using Herbs Collection. For more recipes using potatoes, please see my Potato Recipes Collection. They are part of the Visual Recipe Index by Ingredient, a resource for folks like me eating from the farm share, the farmer's market, the garden, the neighbor's garden, and great deals on ugly produce at the grocery store. Place potatoes in a large pot, add a generous pinch of salt, and cover with water. Bring to a simmer, cover, and simmer for 15-30 minutes until tender. Drain and cut into bite sized cubes. Set aside to cool slightly. I stir my potato salads together when the potatoes are still warm. In a large bowl combine mayonnaise and mustard along with the salt and pepper until well mixed. Stir in celery and warm potatoes until coated with dressing. 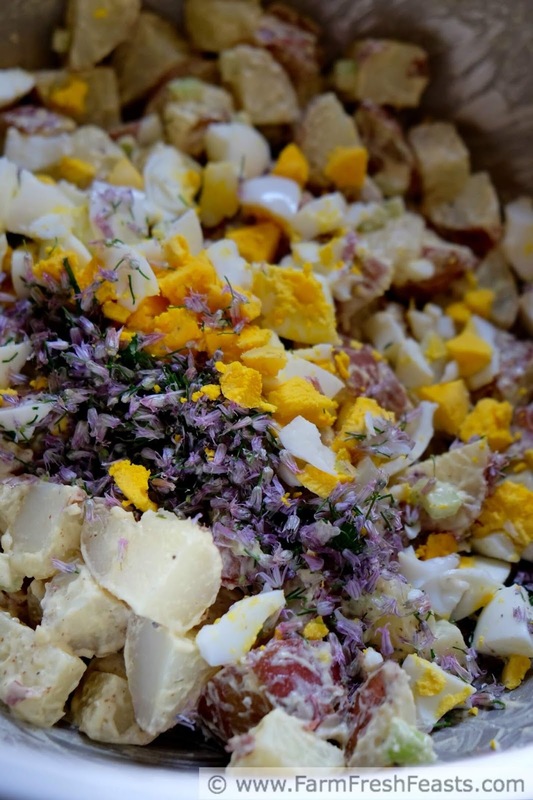 Dump the eggs and chive blossoms on top, and gently fold into the potato mixture. Taste and see if you need additional salt or pepper. I think this is best served warm or at room temperature, but my spouse prefers it chilled. Your daughter has great taste in food. Bring on the potatoes. I love how you used Chive Blossoms here. So creative. 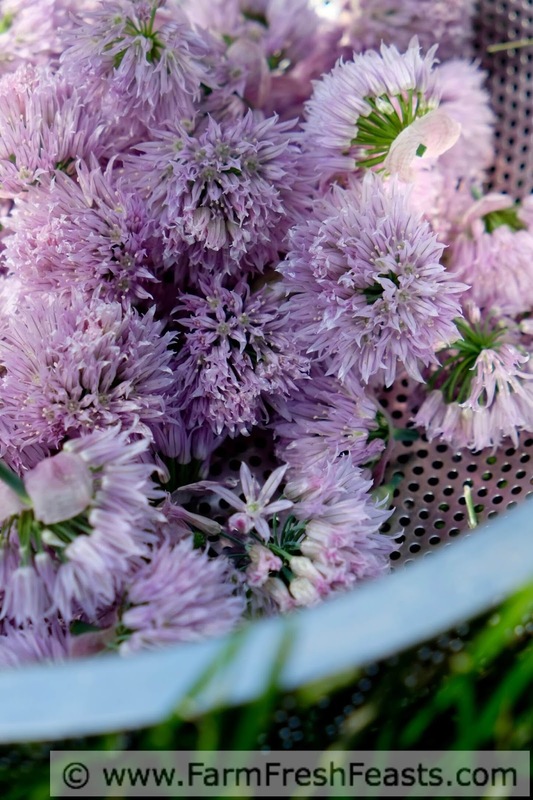 I am patiently waiting for this year's crop of chive blossoms. The weather is toying with me!